I’ve had some not-all-that-worrisome knee pain during this marathon training cycle. I had a little bit of pain after a run here and there, but it always got better within a day or so. Most runs, I didn’t feel it at all. I was being careful and trying to give it the care it needed. And then it was like something pushed it over the edge. It wasn’t either of my twenty mile runs. It wasn’t fast intervals or long tempos. I think it was doing the dolphin kick. I noticed after swimming one day that my knee hurt, which was surprising because, well, I was swimming. Then the next day (my first week of taper), it hurt so badly on my 15 mile run that I cut the run down to 8 miles. Suddenly, I went from mildly concerned to panicked. A panicked Katie is a Googling Katie, so this weekend, I finally searched online for what the problem was. The two main knee issues that runners face are runner’s knee and IT band issues. I suspected it was the latter, and when I read that if you have IT band issues, fast intervals are typically less painful than longer slower runs, I was certain that it was my IT band. Chronic, soft-tissue pain is a new experience to me. I’ve had two running injuries. When I was a freshman in high school, I broke my hip running cross-country. It was a pelvic avulsion fracture, which basically means that the muscle pulled the bone apart. It was a hairline fracture, so my treatment was crutches and pain meds. Once it stopped hurting, it was better. When I was a freshman in college, I got a stress fracture in my fibula. Again, once it was properly diagnosed, the treatment was simple. No impact until it stopped hurting. After spending a few weeks pool running and getting to know the elliptical, I was better. And I never had an issue with it again. Soft tissue problems are a scarier beast to me. Especially when I’m supposed to be running a marathon this weekend. I kept Googling. The words on the screen were basically, “Be careful while you run and add in some hip and glute strengthening activities, and you should be able to get past it.” The words that my brain read said, “You’ll never get better. You will be in pain until you die.” Here’s the thing. The more stress that piles up in my life, the harder time I have maintaining perspective. I tend to catastrophize (it’s an anxiety thing). I’ve become better at not doing that as I’ve become better at managing my anxiety. But when the stressors pile up, that’s right where I go. And, well, the stressors have been piling up lately. All this to say that this IT band issue quickly became something terrifying to me. I had to come up with a plan for dealing with it. After doing some reading online, I discovered that most experts think the underlying issue behind IT band pain is weakness in the hips and glutes. That means to put the issue completely to rest, I’ll need to build up some hit and glute strength. But since I was doing all this research literally one week before a scheduled marathon, I knew that strengthening would have to be part of the post­-marathon process. I was not going to gain hip and glute strength in a week. So my post-marathon plan was going to have to be different than my pre-marathon plan. I guess it’s time to get re-acquainted with this old friend. Ice and ibuprofen—the poor man’s physical therapy. Frozen peas and ibuprofen—a bitter reminder of your sad financial state. So, how does this stupid knee thing affect my marathon on Saturday? Well, I’m not setting any time goals because of it. I know where my fitness is. I know what pace I can run if I’m feeling 100%. Based on my training times, if I’m feeling good, I will probably run between a 3:35 and 3:40. And really, training, not racing, was the main point of this whole marathon training cycle. If I feel like my knee slowed me down, I’ll be disappointed… regardless of my time. I’ll be disappointed if I run a 3:50 because my knee was hurting. I’d be disappointed if I ran a 3:20 (YEAH RIGHT) but felt I could have run faster if my knee were feeling better. If I take care of my knee until Saturday, though, and take some over-the-counter pain medication before running, I think I’ll be able to make it through just fine. I’m typically pretty tough. I finished a cross-country race on a broken pelvis. I completed half a heptathlon on what was at that point a pretty serious (undiagnosed) stress fracture. I’ll make it through the 26.2 miles. And then, I’ll rest up, start a strength routine, and hope for the best. I’ve got five weeks between my marathon and the start of my Ironman training plan, so that should give me enough time to get 100% healthy. This whole potential injury thing has reminded me both how lucky I am to be able to train and that training for an Ironman is a great opportunity, not an obligation. Lately (probably because I’ve been running more than anything else), each workout has felt like something I have to do. That’s normal, I think, and slumps like that are where dedication is important. But the past week, I’ve felt fortunate for the workouts I’ve been able to do and antsy (almost excited, in fact!) to run again. So let’s hope I retain the motivation for Saturday but get rid of the pain! Has anyone else struggled with IT band issues? What worked for you? There’s a conversation I have periodically when I mention a workout I’m not particularly keen on completing. I had it again at work on Friday. My borderline-obsessive need to stick to a plan is mostly a blessing, but sometimes it becomes a bit of a curse. On Friday, I checked the weather and realized it was supposed to snow all weekend instead of rain, as was predicted earlier. I kept checking the weather throughout the day. As my niece would say while shaking her head and inspecting her stuffed animals with her doctor toys, “Not good, not good.” The forecast predicted rain/snow all night on Friday and all day on Saturday. I didn’t know how bad the weather would be, but I knew I wanted a back-up plan. I knew that the treadmill would be my last resort. I can’t imagine much worse than running in place for three hours. I also knew that I was fortunate enough to live in an area with a very nice 442-meter indoor track. I decided that, in a pinch, the track would work fine. When I woke up on Saturday, it was snowing. And it continued to snow throughout the day. I went to Rob’s house in a desire to delay the inevitable decision. He cautioned against running outside, but he’s a very cautious person, so I still fruitlessly hoped running outside would be an option. But I knew. It just wasn’t worth risking an injury or overworking my stabilizing muscles in the slush. Another complicating factor arose, though. The indoor track was closed for most of the day for a high school track meet. It wouldn’t open until 6:30pm. That meant I would be running until almost 9:30pm. I am not an evening exerciser. I hate having a hard run or bike ride hanging over my head all day long. I can manage to squeeze in workouts after work, but barely. And generally, even those “evening” workouts are done by 6:30pm. But it seemed like the best option, so I dutifully fueled for the run, drank water all day, and drove to the track after dinner. When I got to the track, the high school kids and coaches were just leaving. I should have driven over a little early so I could watch them finish up! It was a flashback to high school and college. I was also pleased to note that the ice was full of kids learning to skate and high schoolers on dates. I should have expected that they’d have people skating, but since I’ve only been to the Olympic Oval in the morning, it took me by surprise. Those skaters may have been my saving grace because they were virtually the only aspect of the physical environment that distracted me from the fact that I was running around in circles for almost three hours. Cool story… I did actually have to yield to the Zamboni once during this run. As I mentioned above, this track is 442 meters long which means I would need to run 73 laps to complete 20 (well, 20.05!) miles. Instead of keeping track of laps (which was never going to happen), I decided to keep track of “miles.” Four laps around the track was about 1.1 miles, so I figured out the pace I should probably be hitting for these miles. An 8:47 “mile” equated to a 7:59 mile and a 9:10 “mile” equated to an 8:20 mile. I planned to take my split for each “mile” and track my distance that way. Seventy-three laps converted into 18.25 “miles.” Since I ran my last 20 miler at an 8:11/mile pace, I was hoping to run around an 8:15/mile pace (9:03 “mile” pace) this time around. It’s clear that I was a little slow. I started out without much of an idea about how fast I was going. Somehow, being inside messed with my perception of my own pace. (And when I crossed the first lap, I did some bad math and thought I was going faster than I was. Whoops.) I sped up for the second “mile” (I’m done with the scare quotes now. You know what I mean by “mile” at this point!) before settling into a steadier pace. The run was going reasonably well. I was ticking the miles off without too much mental anguish. And then tragedy hit. Well, it felt like a tragedy, anyway. I had my water bottle, a bottle of Powerade, and my gummies on the padded mats separating the track from the ice. Some kid rammed into the mat and knocked my Powerade bottle off. I collect crappy water bottles, so it burst open and spilled Powerade all over the track. Crap. I had to run over to the bathroom and grab some paper towels so I could kind of clean it up. Okay, not a tragedy. The tragedy came two laps later when I approached the finish line and saw that my water bottles and gummies were gone. Missing. I was certain they had been thrown away and my run was over. I went to the front desk and asked. I started checking trash cans. I asked some guys driving an official-looking little vehicle around. And, after about ten minutes, I ran by the finish line again, headed to the front desk. And all my stuff was still there—just on the other side of the track where it wouldn’t be knocked over by errant pre-teen. Of course. I calmed down, and nothing exciting happened for the rest of my run. It’s been a few days, and the whole thing is kind of blending together in my brain. It was mentally painful, and it made me appreciate running outside. I slowed down a lot during miles 16 and 17. When I’m running outside and get within three or four miles of my finishing location, there’s a homing instinct that kicks in. I naturally pick up the pace a little (or at least, naturally avoid slowing down despite my exhaustion). I get a mini version of what often happens towards the end of the race when adrenaline helps power you through the last few miles. That didn’t happen at all inside. All I could think was, “How bad would it be to stop a little early?” and “I have how many laps left?” You can see from my times towards the end that I was really struggling. I did manage a “kick” during the last five laps, but I could not get my brain and my body to work together to pick it up before then. I also learned something new about myself. I like hills. Not insane climbing, but the periodic hills on my long run route add some variety. I’m not taking the exact same stride a million times. The changes in the terrain give certain muscles a break periodically and challenge certain other muscles from time to time. I was hurting at the end of my flat run far more than I was hurting at the end of my last 20 miler. I think my calf was on the verge of cramping up, and I was feeling some pain in other parts of my body, I’m sure related to the repetitive, pounding motion. I finished and immediately sat down on the track. I felt like a bit of an idiot, sitting there in the middle of the track (out of the other runners’ ways!) at 9:30pm, but it took a good couple of minutes before I could force myself to the bleachers where I recovered for a good five minutes before dragging myself back out to my car, lamenting at how far away I had been forced to park due to the track meet. I struggled through this run. I averaged an 8:17/mile pace which was good, but still a little frustrating considering my 8:11/mile pace last time. For whatever reason, I wasn’t on point. I felt a little slow, and I was surprised at how early in the run I started to feel strained. But despite that, I put a lot into the run. I worked hard, and I never gave up mentally. Really. Those slow miles at the end? I was seriously trying. When it comes down to it, effort is the only factor completely under your control in runs, so while I would have liked to have run a few seconds per mile faster, I’m still proud of myself for working hard, even though the running conditions were so different (and not really in a good way!). If you are looking for a relaxing run, I would not recommend running inside. However, if you’re looking for a workout that will challenge you mentally and build that mental toughness so important for distance runners, an indoor long run might be just what you need. What have your experiences with running (or cycling!) indoors been? What are your tricks for making it through? Refueling after my run. Full fat, full sugar ice cream. With sprinkles for purely aesthetic reasons. I’m stingy. I’ve think I’ve mentioned it on this blog before, but it bears repeating. When I “treat myself,” I go to McDonald’s and get two McDoubles (Quarter Pounders are too expensive!). I buy my make-up and other essentials with Amazon gift cards earned through work. I have two winter running tops. Two. The last time I bought an article of clothing was this past summer for a friend’s wedding. Like, it’s bad. Thus, it’s not a surprise to anyone that knows me that I haven’t ever adopted any of those new-fangled training tools like Garmins and heart rate monitors. Really, though, I’ve learned to enjoy the low-tech running I do. I’m not out to make any converts, but I do think there are a lot of benefits to running without the help of (many) of the tools that have become commonplace. Obviously, I do use technology. When it comes to running, the stopwatch function on my standard Timex watch, an online pace calculator, and MapMyRun are my essentials. I have a very particular process that I go through before each and every run. That’s twice a week right now, when you keep in mind that I’m not doing this for my speed work. I map out a run of the appropriate distance on MapMyRun.com. I don’t usually use the satellite function, but that’s the only way I could get the street names not to show up. If someone is going to stalk me, I’d rather not give them all the info they need. I then look for good places to check my splits throughout the run. Typically, I look for impossible-to-miss landmarks like turns or intersections. Once I’ve chosen the locations I want to check my splits, I figure out exactly how far into my run that location is and then use an online pace calculator to determine what my time should be at that location. The first column is the distance, the second is the time I should be under at that distance. Ignore the rest of the numbers. I reuse Post-It notes. Then I write those splits on my hands so I can check my pace on my runs. This practice amused one of my friends so much that it made it into her product description of a Garmin for Competitive Cyclist*. Basically, I’m famous. For long runs, I may only check my pace every few miles, while I may try to check my pace every half mile or so during shorter runs. And then, while I’m running, I just glance at my watch and glance at the split written on my hand whenever I hit one of those pre-determined pace checkpoints. This is a post-run shot, not an action shot. It’s a pretty involved process now that I think of it, but I think it does have a lot of benefits that I would worry about missing out on if I went the typical Garmin-route. I love being forced to map my route before heading out for my run. Not only does it make me more familiar with the turns I’ll be taking and the roads on which I’ll be running, but more importantly, it helps me visualize the hills I’ll deal with during the route. Utah has some pretty decent hills, and sometimes, the slope is enough to affect your pace but not enough to actually notice it. Having an idea about what kind of hills I’ll face and when during the run I’ll face them helps me tackle my runs in a smarter way. I also enjoy not being a slave to my GPS watch or my pace. I know that if I had a GPS watch, I would check it constantly and obsess over it during every mile of every run. This is simply an unfortunate aspect of my personality. I didn’t want to get an iPhone for a similar reason—I didn’t want to constantly be distracted by games, social media, and the ever-present Internet. When I eventually did get an iPhone, I immediately picked up all the bad habits I was afraid that I would. I don’t want to do that to running. I don’t want to panic when I’m running up a mountain and not hitting my goal (overall) pace. I don’t want to see I’m running faster than planned and panic and slow down, even though I feel great. For me, running without a GPS watch has helped me learn to be a better judge of my effort. I spent the first half of my marathon training cycle worrying that I was running too fast before embracing it and judging my effort based on how I feel during and after the run. It turns out, I was more capable than I thought. I’m not sure I would have realized that if I had been holding myself back because a glance at the GPS watch revealed a sub-8:00/mile pace one mile into an eight mile tempo run. I’ve also read too many horror stories about people pacing only by their GPS watch, only to be screwed when they realize their GPS watch is wrong or when the GPS watch can’t manage to find a signal at all at the start of a race. If I got a GPS watch, I know I would become dependent on it. And because stuff happens (batteries die, signals are lost, tangents are run poorly), I want to maintain my independence from GPS more than I want the information and convenience a GPS watch would undoubtedly give me. And finally, I’m going to offer up a reason that I know isn’t fair. Despite generally being uncomfortable building narratives, I’m able to admit when I do succumb to building narratives in my life. This is one of those times. I don’t have a GPS watch for the same reason I don’t listen to music when I run. There is an imagined simplicity and purity to running by yourself, without much help from technology. I mean, I know my regular wristwatch is technology, but that hardly seems to count these days. I love stepping out the door and feeling like it’s just me and the road. There’s something exciting and kind of risky (and, yes, stupid) about leaving for a long run with no phone or GPS. It’s like you need to know yourself and know the area to make sure you will make it back as planned. Obviously, there are workouts that I can’t do without a GPS watch. And if I were a “real” runner instead of a triathlete, I’d probably need to break down and get one. I can’t go out and do intervals of 10 minutes at a 7:15/mile pace and 2 minutes at an 8:30/mile pace. Any intervals I do in the middle of a long run need to be measured by RPE (rate of perceived exertion) instead of by pace or heartrate. It would be hard for me to swing a fast finish long run unless I was able to manage to do it based on effort alone. Plus, as I mentioned above, I’m missing out on a bunch of data that I would probably over-analyze and obsess over… but I would also probably enjoy doing that. Like I said earlier, I’m not trying to make any converts here. GPS watches are really useful training tools, and I probably should have one. I’ve run across articles and blog posts about the benefits of doing recovery runs without GPS watches to keep you going slow and to prevent you from obsessing over pace. But I would also say that it can be useful to do some of your more serious workouts without a GPS watch. I’ve shocked myself (in a good way) when I calculated my pace for some of my tempo runs (7:40/mile for 8 miles?!) and some of my long runs (7:51/mile for 15 miles?!). And I’ve noticed that, despite my fears, I don’t seem to recover from the surprisingly fast runs any slower than the surprisingly slow ones. The time it takes me to recover from hard runs seems to be, well, kind of random, but with more of a correlation with how the run felt than the actual pace of the run. That’s why I embrace low-tech running and have no current plans to buy a Garmin (or any other brand of GPS watch). That could change for any number of reasons in the future, but for now, I’ll scribble my splits on my hand before leaving for a run and pray I’ve chosen the right direction when I can’t quite remember which road I was supposed to turn on. *I’m not getting any money from Competitive Cyclist. I just know people who work there and am amused that I inspired a portion of a product description. I had been eyeing my most recent long run on my schedule since I first decided on my marathon training plan. Still, I was surprised at how manageable it seemed to me. It makes sense, of course, because this run was only a mile longer than the one I did the previous week, but it was encouraging to see what felt like a big accomplishment mapped out on the computer screen in front of me and thinking, “I can totally do that!” I prepared for this momentous occasion in the only way possible—I played video games after work and then spent the evening with Rob at his parents’ house, eating leftovers and playing Cribbage. The plus-side to winter is that I don’t have to set an alarm on the weekends. I go running near midday instead of early in the morning during the winter to give it a chance to warm up a bit. So, after waking up and eating a banana, I headed over to Rob’s place for second breakfast (coffee and two small sandwiches on leftover rolls). By this point, it was only about 8:00am, and I wasn’t planning on running until about 11:00. So we sat around. I dinked around online, doing absolutely nothing useful, and Rob actually did work. Like, for his job. While he was earning a living, I scrolled through my Facebook feed too many times to count, drank a bottle of water, and ate a bowl of frosted flakes. Eventually, I started to get antsy. It was time to get going. So I left to complete my last pre-run task—the laying out of the water bottles. Because I’m neurotic, I’m incapable of carrying water on my person, and because it’s winter, there are no water fountains working in the parks. To make sure I stay hydrated on my runs, I plant water bottles along my route. On Saturday, I planted two water bottles, one of which I would pass by twice. My water stops were planned near mile 4, mile 8, and mile 12 of my run, and I planned to eat one Shot Block while approaching each of these stops. Once I got back to Rob’s place, I drank a glass of chocolate milk as my last bit of pre-longest-run-ever fuel and headed out the door in some capris and a long-sleeve dry fit shirt (it was in the upper 30s and partly sunny). I did my best to start out slow. I knew I had a long 15 miles ahead of me. Plus, my standard long-run route starts with a pretty significant and long hill, so I know if I start too fast up that hill, I’ll burn myself out. My pace felt easy up the hill (as it better if you are going out for a 15 miler), and I was pleasantly surprised when I hit the three-mile mark—my first “time check”—at an 8:25 pace. I had paced out the run at an 8:30 pace, but because the first three miles were uphill, I didn’t think I’d be hitting that pace yet. There was a nice downhill segment that started just after mile 3, and I was cruising. I stopped briefly for water at mile 4 and checked my time at mile 5. I was unsurprised to see that I had sped up. At this point, I remembered that this was my longest run ever. I tried to think about that as a bit of motivation, but all I could muster was a half-hearted, internal, “yaaaaay…” Then I realized I was a third of the way through my fifteen mile run already, and that brightened my spirits considerably. I didn’t have to force myself to be excited about that one. The next three miles flew by (that particular segment of my route always does), and before I knew it, I was at mile 8 and refueling with a Shot Block and some water. About a mile before, I felt my energy start to drop a bit. The fuel and water perked me right back up, though. Shot Blocks have been wonderful fuel for me. I was surprised because I thought the motion of chewing and swallowing would be too much for me when I’m running. But it hasn’t been a problem at all. If I were running faster, the physical task of getting a gummy out and consuming might be difficult, but I haven’t had any problems at my modest pace. Additionally, the sugar plus the tiny bit of caffeine in each block gives me a noticeable boost (or maybe my fueling has just lined up with downhill sections?). Sugarhouse Park always goes by quickly because there are people and dogs and ducks to look at (none of which are visible in this photo). Another photo of the path in Sugarhouse, right as it meets back up with the main road. These photos were taken post-run, while picking up my water bottles. I don’t carry my phone with me when I run. Miles 9-12 were a slog. I had already been out for over an hour, but I knew I still had about an hour left. For me, that’s psychologically the toughest part of a run. I was still running at a sub-8:30 pace, and I wasn’t really struggling to keep up that pace. I was just ready to be done. My left knee was aching on and off (my new shoes just got here yesterday, though! ), and my body was just starting to feel tired. When I hit the ten mile point, I had another little internal celebration because I was two-thirds through my run, but it was less jubilant than my celebration five miles ago had been. I had either biked or run on all of the roads in this section before which gave me some idea what to expect. And I’m glad I knew what to expect because the route took me under the freeway, by way of a steep downhill followed by a steep uphill. The downhill and uphill were both very short (shorter than a quarter of a mile), but with my knee giving me some pain and my fatigue building, neither one was enjoyable. Technically, this was the view looking back near mile 12. Once I fueled near mile 12, though, I was feeling much more positive. Downhill, then a short uphill you’ve run a thousand times, then downhill to the finish. I concentrated on the rhythm of my stride. I also thought about the couch I would be sitting on soon. I thought very little about the fact that this was my longest run ever and I was almost done. Sentimentality rarely makes its way into my actual performance of tasks or milestones. The uphill section was hard, and I could feel in my legs that if the run had been much longer, I would have hit a wall. I tucked this little bit of knowledge away as something to keep in mind for my upcoming 17 mile run. At this point, I was just thinking, “Yale, Yale, Yale,” Yale being the street I would turn on to run back down the final hill. And then I turned on Yale. I still had over a mile left, but it was downhill. That made it much easier to keep my pace up, but my legs were aching. It wasn’t my joints or any scary muscle pain. It was just a deep, dull, please-sit-down-we’re-tired ache. I typically try to pick it up the last mile or so, but I knew I was far ahead of my planned 8:30/mile pace, so I let myself finish the run on autopilot. It wasn’t worth pushing myself to exhaustion over a few seconds on a training run. I had one final, annoying stoplight break literally less than a block from the end of my run. Way to ruin my dramatic finish, stoplight. And then, I was done. I slowed to a stop, gave a melodramatic groan, and then sat down in the grass before realizing that was a little silly and slowly making my way back to Rob’s place (I had to run a few houses past his to hit exactly 15 miles). I finished the run in 2:01:44 and was surprised when I plugged that time into a pace calculator and realized I’d finished the run in an 8:07/mile pace. I ran similarly fast the previous week, and I thought that last week’s fast long run would make this one a bit slower. My fitness and recovery is definitely improving. As I had suspected, I walked into Rob’s house and groaned when he asked me how my run had gone. Considering I knew I had run well, that felt a little disingenuous, so I clarified. “Well, I mean, it went fine, but it was a run.” He nodded in understanding. There were no fireworks or celebrations for my “longest run ever” because, as I had guessed, the moment I actually accomplished the milestone, it stopped mattering much to me (this is how you get sucked into an Ironman, people!). But still, over the next few days, I periodically found myself thinking about my last couple long runs, and not just because my sore quads were reminding me every time I tried to sit down. And I felt a kind of subtle but deep-seated satisfaction when I did. I can’t help but think that it is a Really Cool Thing that I can just go out on a Saturday morning and run for fourteen or fifteen miles. I know I’ve worked hard to get to this place, not just the past few months but with all the base-building I did for my half-Ironman and for my Olympic triathlon this summer. It has reminded me just how impressive bodies are. They really can do amazing things if they are properly prepared. Now let’s just hope that in eight months, my body can travel 125.6 miles further than it did on Saturday. The other day, I was cooling down after finishing my speed workout. 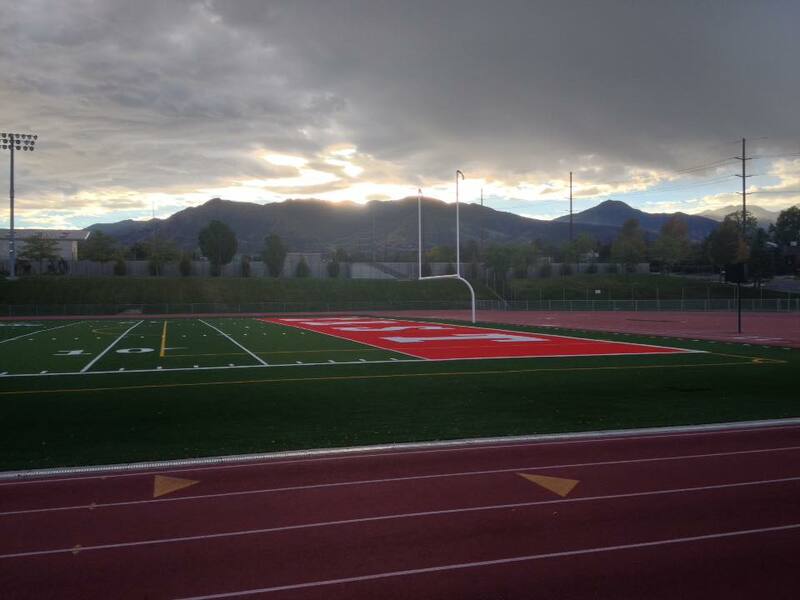 For me, a cool down after speed work consists of 800m of what I like to call the “high school PE shuffle jog.” As I plodded down the homestretch, hunched over and barely lifting my feet off the track, a thought passed through my mind, unbidden but entirely true in that moment. I hate running. This might seem surprising for someone who has run her entire life and chose to train for a marathon, even though the culmination of that training would be a 26.2 mile training run and not an actual race. It might seem like a strange thought for someone who, even when she wasn’t training for anything, ran 1,000 miles in a year and who credits running with keeping her sane. But it didn’t surprise me at all. I have spent a large portion of my life actively hating running. And that’s why I’m writing a Thanksgiving post about it. Naturally. I know there are people who genuinely love running with no reservations. I know people who struggle with taper and who have a hard time cutting back (even when it would be good for them!) because they simply love getting out there and hitting the pavement so much. I know these people are being honest about their love of running, but… I just don’t get it. Running and I have typically had more of a sibling-esque relationship. Running is the annoying little brother that would poke me in the back seat during car rides and tell me I smelled bad, so I would punch him in the shoulder. But ultimately, I knew that he would be around whether I liked it or not, so I would always come to terms with that and make up. All while growing up, I just assumed I would run track once I hit junior high. My dad had been a good runner in high school, my older sister was an exceptional runner, and I was typically one of the fastest girls in my PE class. So every year at the elementary school track meet, I’d lace up my little shoes, face my all-consuming nerves, and race those races as hard as I could because I knew that running was my future. Note that “hard” doesn’t mean “fast.” My parents have a video of elementary-aged me swerving all the way to the far edge of the lane next to mine before returning to my lane at the end of the race because I was trying so hard I couldn’t even run straight. I wish that kind of obsessive effort were as cute in 27 year olds as it is in 10 year olds. By the time I hit junior high and was ready to start running track for real, I knew two things for sure: racing was the most nerve-wracking experience out there (still true) and I really wanted to be good at it. I had a pretty bad case of second-child inferiority syndrome in regards to running. It would have been hard not to since my older sister was, at the time, literally the fastest middle distance female runner in the history of the state of Idaho (she set overall state records in the 400 and 800). Fortunately, my junior high track coach saved me from a lifetime of my inferiority being on display for everyone to see by turning me into a hurdler. It’s actually a pretty good tactic fast kids who just wouldn’t be fast enough to win open events. And it worked out well for me. Crippling nerves and hatred for running aside, I had a successful high school career and consistently earned points for my team during our State meet every year. And this was one of the reasons why running has remained in my life, despite my mixed feelings for it. Scrawny, nerdy, and socially awkward girls with anxiety and self-esteem issues tend to struggle in high school, especially when they have a well-liked, accomplished older sibling that everyone in the whole school knows. Running track gave me both something to be good at and a group where I belonged, so I built up a loyalty to running, despite the fact that every year I dreaded track season and every day during track season I dreaded practice. After I graduated high school, I ran track at a NCAA Division III university for two and a half years (DIII, by the way, means no scholarships). I could say a lot about college track, but I won’t. For various reasons, it didn’t go well for me. So many different issues contributed to my failure that it would be impossible to lay them all out. I struggled because of everything from my own emotional state (I went through probably my worst period of depression in college) to the coaching (there was nothing wrong with my coach’s personality or tactics, but I think my particular body would have responded better to different workouts) to my own lack of talent (I tried to be a heptathlete which involves coordination and learning new skills… not my strong points). It was a frustrating and sometimes devastating experience, and it’s probably a large part of why I spent five years thinking I had absolutely no talent whatsoever. I was okay at long jump. I mean, not good, but not terrible. Yeah… this is not the angle the javelin is supposed to have. I stopped running competitively, even competitively with myself, because I hated running and now I wasn’t even good at it. But I kept running because, like that annoying sibling, I also needed it and would have missed it desperately if I cut it out of my life entirely. Running was the best treatment for my anxiety and depression that I had found, and after spending one semester not working out at all and seeing all my motivation and willpower dissipate, I begrudgingly went back to running regularly because I needed to graduate, and it seemed like running somehow helped me balance the rest of my life. When I ran, I went to bed early, got up early and got stuff done. When I didn’t run, I didn’t do any of the other things either. In order to remain a functional adult, I continued to run, sometimes enjoying it, sometimes hating it, but mostly just accepting it as a part of my life. 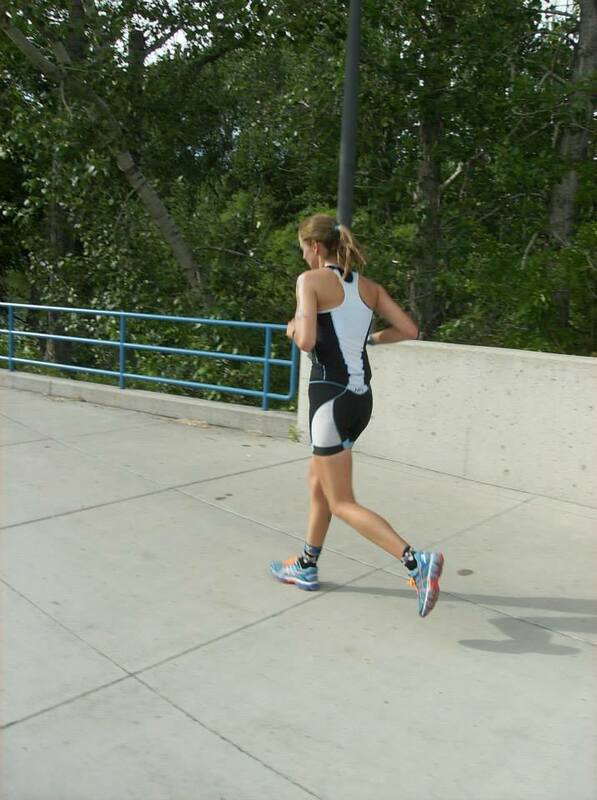 It wasn’t until I got into triathlons that my interest in running was rejuvenated. And, especially since I started marathon training this year, I’ve started to realize that maybe I’m not actually horrible at it after all. I’ve been enjoying the number-crunching and the goal-setting, even when I’m not enjoying the running itself. 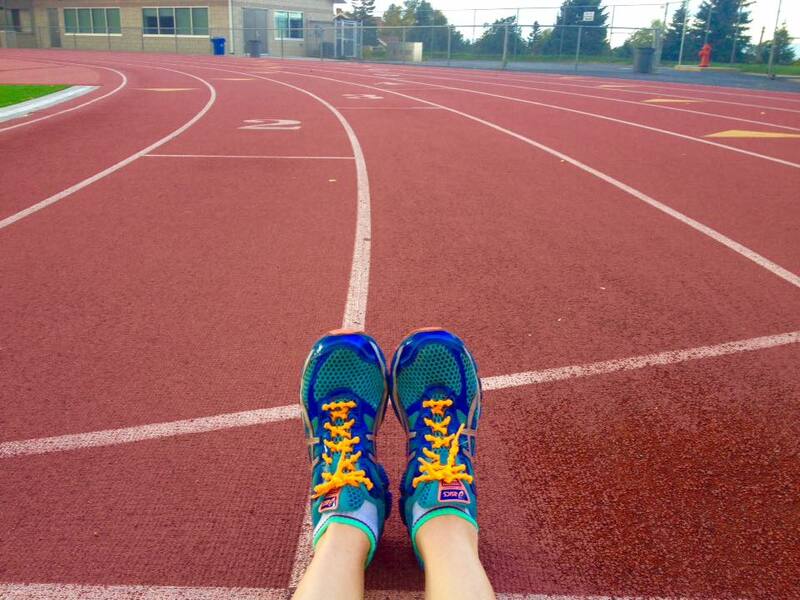 I’m realizing what I knew in high school—that there’s more to running than running itself. There’s goals and achievements and friendship and beautiful views. So this Thanksgiving, I’m thankful for running—my annoying little brother. 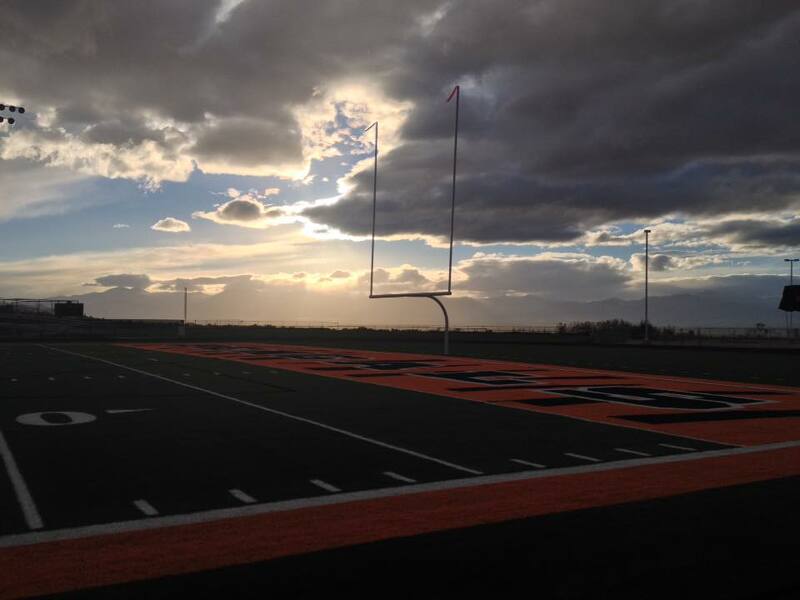 I’m thankful that running gave me a place to belong in high school when I wouldn’t have had one otherwise. I’m thankful that running is now giving me something to share with my dad. I’m thankful that running gave me a way to balance myself for years before I discovered the joys of cycling. I’m thankful that growing up running taught me to appreciate what my body can do for me more than what it looks like. I’m thankful that I started running in junior high, and I’m thankful that for some reason I kept going and that running is still a part of my life fifteen years later. Even if it is a twerp. I’ve been mentioning my marathon training in passing, without going much into the “how” or the “why” behind it. Because I’m a bit of a lone wolf in regards to my triathlon hobby (although less than I was six months ago! ), this was a decision that I made entirely on my own. I started considering doing a marathon training cycle about a year ago. I knew I planned to do an Ironman in 2016, and I liked the idea of having some more confidence in my running endurance. I’ve ridden a few centuries and done a few swim workouts that hit two miles, but the longest run I’ve done is around 14 miles. Fourteen miles does not translate to confidence in my ability to run 26 after the swim and bike leg. I had sort of, tentatively, very loosely planned on doing some sort of marathon training plan last winter, but I moved to Salt Lake City at the end of November, and I lost motivation. I got busy with a new job, a new city, and the anxiety that comes along with those, so I barely managed maintenance over the winter. Besides, the nebulous “they” (read, the Internet) said you didn’t need to run a marathon before doing an Ironman anyway. But still, as this past summer progressed, the idea of doing a fifteen, eighteen, and twenty mile run for the first time during Ironman training… well, it scared me. So when I heard that Coeur d’Alene was being moved to the end of August instead of the end of June, I started looking into a marathon training plan. Long story short, I decided to go for it. A 16-week training cycle fit into the winter months really well, and I figured focusing on running would alleviate my guilt for not spending hours on a trainer riding my bike. I’ve laid out some of my reasoning, in FAQ style. Now, these aren’t questions I get asked frequently, but they are questions that I frequently have for other people who are training for marathons. So… I decided that was close enough! Why did you decide to train for a marathon? The number one reason I decided to train for a marathon is confidence. As I mentioned above, I have never gone on a run significantly longer than a half marathon. My Ironman training includes some long runs, of course, but the thought of doing my first and only 20 miler in my life just a couple months out from an Ironman does not appeal to me. The other reason is to keep me active during the winter. I want to do some significant endurance training during the winter. Cycling is out of the question unless I want to spend all winter staring at a wall on a trainer, and swimming offers limited gains because of the relatively short length of the swim leg. I actually don’t think it’s necessary to run a marathon before doing an Ironman. An open marathon and the marathon leg of an Ironman are different beasts, and you should approach them differently. Additionally, “they” say one of the best ways to improve your triathlon run is actually to focus on the bike leg so that you start the run with fresher legs. Training for a marathon isn’t necessary, but because of the confidence factor, it’s the right choice for me, at least this time around. I remember in vivid detail how horrible I felt when this picture was taken at mile 11 during my Ironman 70.3… I do not want to feel that way at mile 11 of my Ironman marathon. Why aren’t you actually culminating your training cycle with a race? Yep, that’s right. My “race” will be a 26.2 mile training run. There are two reasons for this. First, even if I wanted to, there isn’t a local race that works within the time frame of my training schedule. I guess not a lot of people have the desire to run a marathon at the end of February. Second, racing a marathon takes a lot out of a person. It’s a big ordeal. I’ll be starting my Ironman training plan just about a month after running my “marathon,” and I don’t think that would be quite enough time to recover after a hard, all-out marathon effort. So, I’ll cut out the anxiety and recovery of a full marathon and just enjoy a long training run with my dad some time in February. 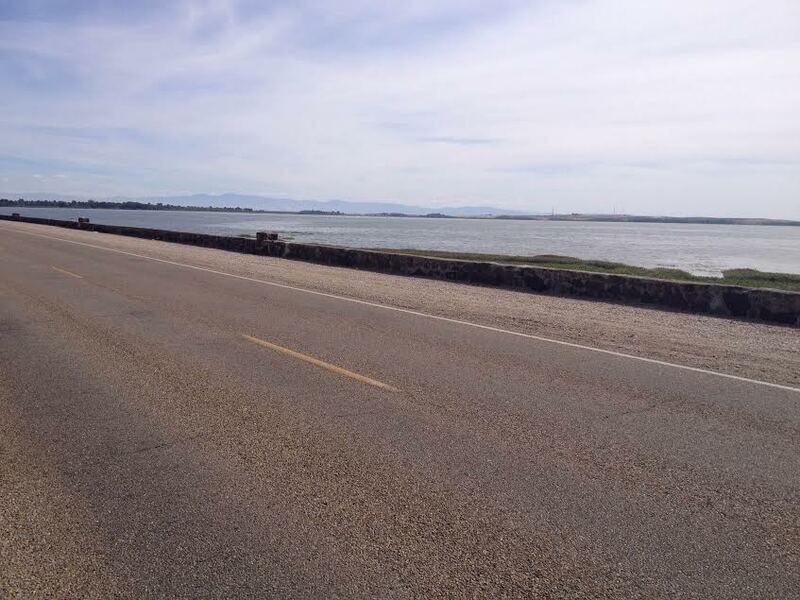 We plan on running the course of the Lake Lowell marathon that usually takes place in the spring. The bonus is that the course is pretty much flat as a pancake. The scenery on the course isn’t bad either. What training plan are you using? I’m using a plan I found online known as Run Less, Run Faster that was created by the Furman Institute of Running and Scientific Training. There’s a whole book about it, but I just used the version of the plan I found on Runner’s World because cheap. And lazy. Essentially, it’s a training plan that has three runs a week—a track workout, a tempo run, and a long run. I’ve taken the template I found and added in my specific paces. If you’re interested, the whole thing is here. Why did you pick this particular plan? Even though I wanted to avoid setting a goal for what will be a glorified training run, I kind of set one anyways because of course I did. (What can I say? I really like goals!) I’ll be running my long runs at an 8:45/mile pace, so I’d be pretty disappointed if I failed to break four hours (9:09/mile). I’m going to try to run my marathon at the same pace as my long runs which would put the final time at 3:49:25. Because I’ll be running a flat course that is about 2000 feet lower in elevation than Salt Lake City, I may end up running it faster. But my dad and I will play it by ear. Even though I do have a couple goals, both are goals that are well within our abilities (I say “our” because we’ll be sticking together), so bar something unexpected like an injury or really bad cramping or something, we shouldn’t have to kill ourselves to perform at the level we want. What are your biggest concerns going into marathon training? My number one concern is loss of bike fitness. I know that running and cycling are great cross-training for each other, and I know it’s hard to fit cycling in during the winter anyway. But I’m still worried about losing my cycling base over the winter. I only plan on cycling a couple hours a week at most during much of the winter, and I’m worried the lack of cycling on the off-season will hurt my bike leg. The bike leg is significantly longer than the swim and the run, so a sub-par performance on the bike is a huge detriment to your overall triathlon performance. 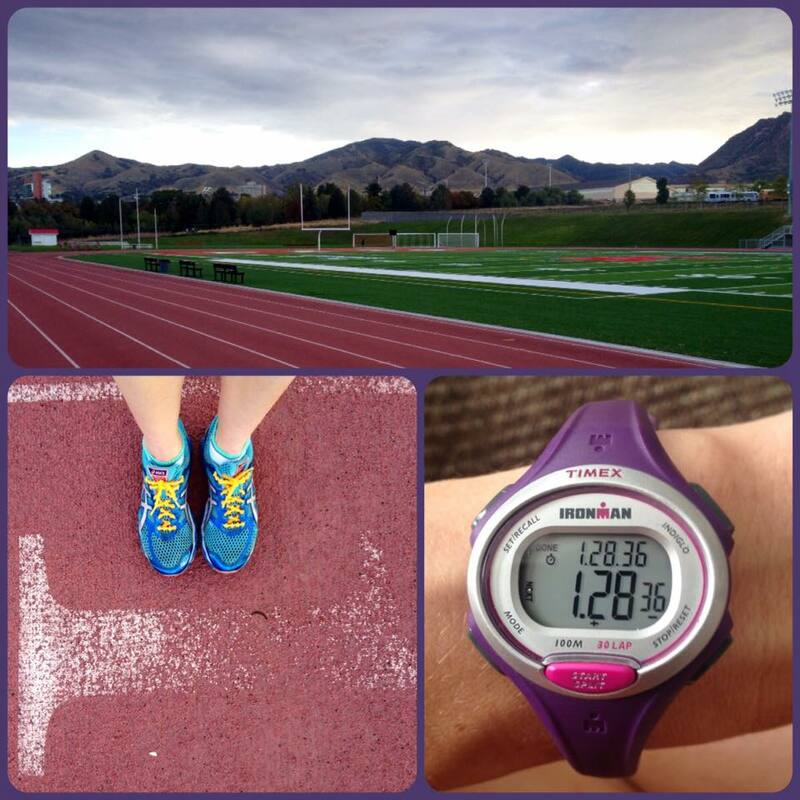 So, here’s to a winter full of long, cold runs and getting re-acquainted with the track! During the summer of 2014, I did a few track workouts when preparing for my Olympic distance triathlon at the end of the summer. The first of those few workouts was the first time I’d run on a track in years and the final was the last time I’ve run on a track since. Until last week, that is. I had been considering doing some speed workouts to get back into the groove before marathon training starts in November, mostly because of what I noted above—I haven’t run fast in a long time. And while I had been feeling very confident in my ability to conquer the speed workouts outlined in my marathon, I was disabused of that notion after a confusingly horrific attempt to do intervals on a treadmill a couple of weeks ago. I set out to do 400s at a 7:00/mile pace which I thought would be a total breeze because I ran the final mile of a five mile run in about seven minutes a month or so ago. Yeah, it didn’t go as I planned. After a nice half mile warmup, I managed a measly four 400s on the treadmill before allowing my wheezing, shaky, and dizzy self to give up and bathe in my own shame. I honestly still don’t know what the problem was. Altitude? That cold I had? An unconquerable lack of talent? Hubris? Or maybe it was just random. I knew I couldn’t even make a good guess until I tried a speed workout again to see how it went a second time. So I was tentatively planning on doing that before starting my marathon training (hopefully as a confidence rebooster), although I hadn’t definitively decided which weekend I wanted to face my reckoning. If I’m being honest, I was kind of avoiding it. But last weekend, Rob and I spent some time with his extended family (cousins, aunts, uncles, the like). His cousin mentioned that she had set up a 5k to raise money for a family whose father was terminally ill and asked us if we’d be interested in participating. Rob immediately agreed to sign up as long as he didn’t have to run (or walk) the course. I hemmed-and-hawed a bit. And by the end of the meal we were having, I had pretty much decided on it. I think it was the prospect of writing a race report that sold me. So unless my little niece arrives this week and I go back to Idaho to meet her next weekend, I’ll be running a 5k. This brings me back to the beginning of the post and the speed work that I’ve been kind of considering but mostly avoiding. I’m loathe to attempt to race a 5k when all of my runs have been sitting in the 8:15-8:30/mile zone. Since at this point, a track workout seemed like it was unavoidable and was something I should do sooner rather than later, I scheduled a speed workout on Sunday, the first since my failure a few weeks ago. I decided to do the first workout on my schedule for marathon training—8 x 400m at a 7:00/mile pace (which translates to 1:45 for each 400). So, Sunday morning I got up at 6:00am sharp to get ready for my workout. (I think it’s important to note that “getting ready for my workout” generally just means getting up early enough that I have time to eat, digest, and otherwise wake up enough physically to have a good workout.) I had a couple of slices of cold pizza for breakfast, starting drinking my obligatory bottle of water, and just hung out and enjoyed the morning until about 7:30 when I left for the track. 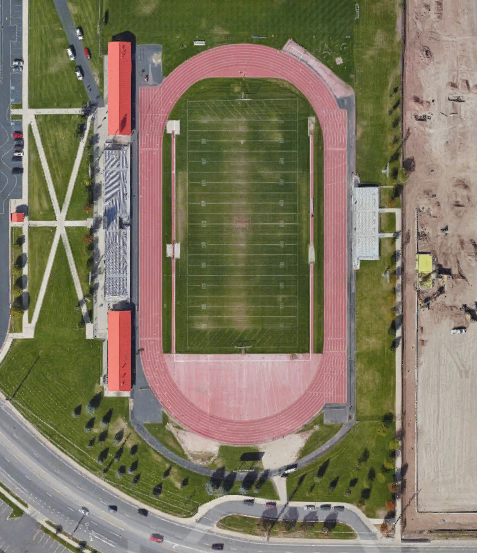 I had looked up the high school where I planned to run on Google maps and had even used the satellite view to make sure I knew where on campus the track was. Nothing stood out to me when I saw it. But they must have revamped the whole stadium since the satellite view was last updated. As I pulled up to the track and parked, all I could think was, “This must be where the rich kids go to school…” The track was a nice as a lot of college tracks I’ve run on, and the football field was entirely new Astroturf. I kind of felt like I was running at a college and was actually worried that the whole place would be locked to the public because it was too nice. The only other person dumb enough to be at the track at 7:45 on a Sunday morning was a guy who I imagined to be a football coach at the high school. He was dressed like a coach and was walking around the track looking at a clipboard when he stopped to adjust the sled (the thing football players use to practice hitting). So while I was running, I built up a little story about him and how he needs to be in the stadium when he’s creating and reviewing plays because of the inspiration the stadium atmosphere provides. After an easy 800m warmup followed by five strides, I was ready to start my repeats. Now, I haven’t tried to hit a specific pace while running in a long time. While I’ve been tracking my pace on my recent runs, I haven’t been setting out to run slower or faster depending on the workout. I’ve just been going out and running five or seven miles comfortably hard and figuring out my pace after the fact. So when I set off to run a 400 in exactly 1:45, I pretty much just guessed, knowing that I would check my time at the 100m mark to see how close I was to :26, which was the time I was aiming for. I started off at a slow-fast pace. That’s my own very special term for the speed at which I naturally switch from a mid-foot strike to a toe-strike. I’ve spent a lot of hours in my life running fast on a track, so that’s what I default to in track situations. It feels strange to run with my mid-foot strike “long distance” form on a track. With the exception of the first accidentally-way-too-fast 400, I feel like I approached this workout perfectly, despite the fact that my paces ended up a bit faster than expected. I needed to actively hold myself back for the first few 400s but was pushing myself at the end of the last few 400s to stay under 1:40. And better yet, I managed to regain all the confidence I lost with the treadmill fiasco and then some. I was surprised by how much I enjoyed getting back to the track. I spent countless hours at various tracks in the Northwest from the time I was in junior high until the time I was a junior in college. 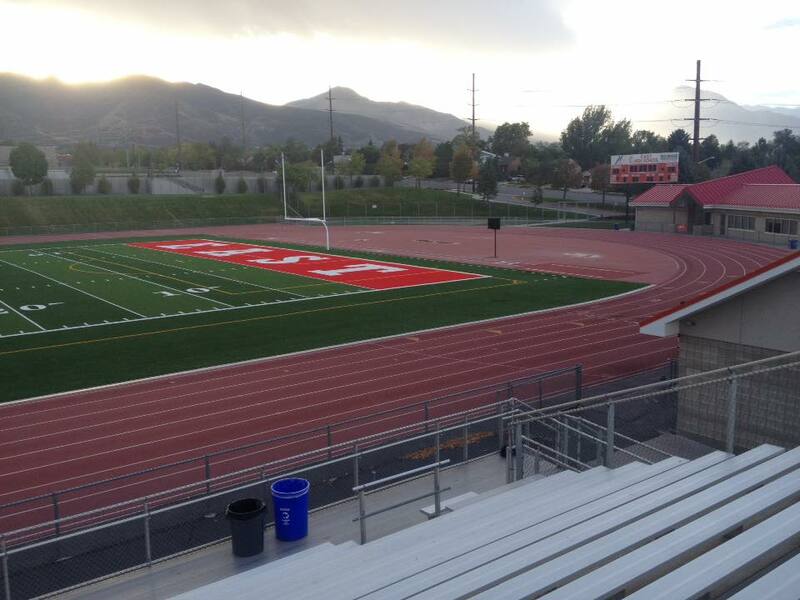 Strange as it may sound, doing 400 repeats on a track feels a little bit like coming home. Perhaps a more apt metaphor would be that it feels like visiting my childhood home. The way I feel as I lean into a turn is comfortable, and the rhythm of my feet hitting the track is soothing. Added to the familiarity was the fact that I was running just as the sun came up over the mountains, which is one of my favorite times of day. It was comforting, invigorating, and inspired just a bit of nostalgia as I was reminded of one of my “past lives,” as I like to call experiences that seem so distant from where I am now that it seems like they were lived by someone else. All this would have been different had it been one of those gut-wrenching, vomiting by the side of the track workouts, of course. Those inspire nothing but pain, but this workout was a nice balance—hard enough to remind me of what I miss about track, but not so hard that I remember why I didn’t miss it to begin with. I’m thankful for that because over the last few weeks, I’ve been noticing surprising little moments of excitement as I think about starting marathon training next month. This is not something that I, or anyone else, would have ever expected from the girl who whined when her dad dragged her on three miles runs during high school. And those little flashes of excitement are as encouraging as they are surprising, so I really want them to stick around. Now that I’m a blogger, I think I’m obliged to start taking photos of my feet.